Spacedec Articulating Wall Mount for 10in to 24in LCD is brilliantly engineered using the highest quality materials, the SD-AT-DW is a fully ergonomic design for wall mounting of monitors up to 19.8lbs (9kg). The arm extends to 24” (610mm) and has flexibility at the core of its design. 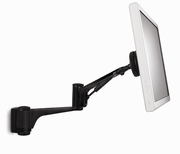 Three separate articulation points move the monitor in every direction with unbelievable ease. This ensures that height, tilt and rotation are all fully adjustable from a seated position, making this one of the most versatile wall mounts on the market today.